Something that you know, such as a Personal Identification Number (PIN) or a password. Something that you are, such as a finger print or retinal scan. Something that you have, such as a hard token (for example, a key fob or soft token), which is software-based). 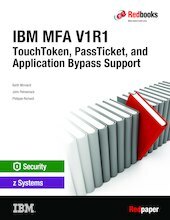 This IBM Redpaper™ publication helps you install, customize, and configure IBM MFA for z/OS® V1.1.0. It also provides information that is based on our experience in a controlled environment.